It is snowing here. Stanley is itching to get outside to play while I am perfectly happy to stay warm inside our home. Neighbor Girl did a lovely job at the craft show this weekend. 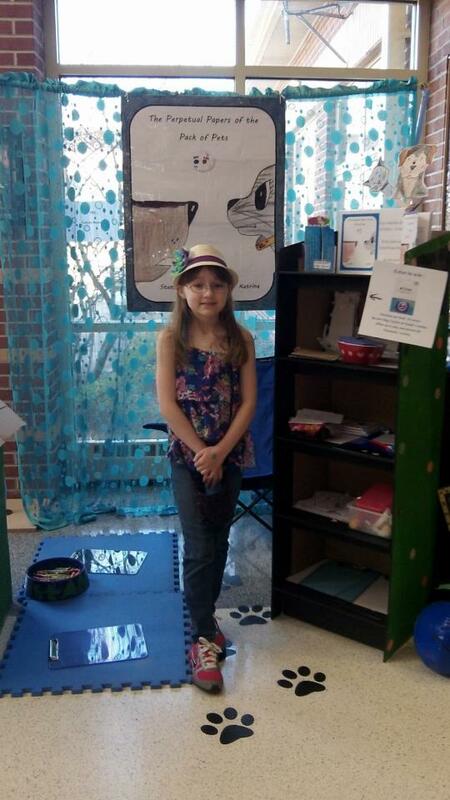 She set up the stand with her mother and I heard she did a great job of handing out our bookmarks for us as well. Way to go, Neighbor Girl! Click here to view all of the pictures from the craft show. She shared with us that many children made puppets of Stanley and me when they stopped by the area. How fun! Mr. Jeff W. was the lucky winner of the iTunes Gift Card. Congratulations, Mr. Jeff! Welcome to our new subscribers! We are happy to have you join us. We do post daily on our Facebook page but to keep your inbox less cluttered, we try to post the really important announcements here on our blog. Monday - Katrina shares a word that she likes with her Word of the Week post. Tuesday - We share a favorite quote. Wednesday - Stanley shares a fun animal fact. Cool Mom sometimes reviews books, on our blog. Thursday - Zorg teaches us a lesson about aliens. Friday - We put all of these neatly in a post on right here on our blog, so those of you who are not on Facebook will be caught up! Take a look at last Friday's post for an example of these. We recently received this lovely review from Miss Jemima Pett. She has the most adorable guinea pigs and writes about their adventures! Cool Mom will be posting a review of her book shortly. Thank you, Jemima for your kind words. Oh, and guess what? Our book will be part of a giveaway she is having in April! Stay tuned for more on that. Ooooo, Stanley just went outside, so it is time for me to grab a seat at the window for his snow time show. Then I will take a well-earned nap. Have a lovely day and thank you for stopping by. PS - There is only a little over one day to enter out current giveaway for a Limited Edition BEAUTIFUL picture book. Not available in stores yet!! !